In mill mixing, the elastomer is first added to the nip (Gap between two rolls), open to about 6mm, at the top of the rolls. A band of elastomer then passes through the nip & is formed around the front roll. Depending on the elastomer used, varying degrees of difficulty may be encountered in forming the band initially. However after a few passes, a band will form & can be fed back into the nip continuously. The elastomer is then cut back & forth twice to assure proper blending & to allow the elastomer in the bank to go through the nip. All dry ingredients, except the fillers & the cure system, are then added to the nip. The compound is then cut back & forth twice to assure good dispersion of these dry ingredients throughout the batch. The next step is to open the mill slightly & add the fillers slowly to the batch. In order to prevent excessive loading of fillers at the centre of the roll several times during this operation & thrown back in to the bank. When most of the fillers have been mixed into the compound, the liquid plasticizers & the rest of the fillers are added filler is visible, the batch is cut back & forth twice more to assure good distribution of fillers ''PIG'' roll the batch & feed the ''Pigs'' back into the nip at right- angles as a past of the cross-blending process. The next step is to open the mill more & add vulcanizing agents to the batch. When the vulcanizing agents are well distributed, the entire batch is cut back & forth at least five times to assure thorough cross-blending, before being sheeted off the mill. Calandering is an efficient process for producing flat rubber sheets & for lamination, frictioning, coating & embossing operation. This process is done by calander machine. 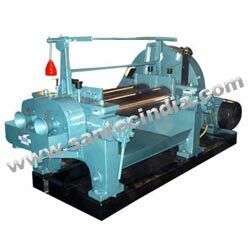 Calander machine is similar to a rubber mill, where rubber & other components pass between two or more metal rolls. However, in order to produce product of controlled thickness, significantly higher pressure is needed, hence calander rolls, journals & frame are more carefully designed & constructed. The extruder has two main functions : to pump the rubber compound through the barrel & to generate enough pressure in the process to force the material through a die to give the required cross-sectional shape. The compound, usually in the form of a strip, is fed at a controlled rate into the extruder, which imparts heat & some distributive mixing moves the material along the machine & generates the necessary pressure. After leaving the die, the product has to be cured, cooled often cut to length & packaged or coiled for transport to the customer.